Therm-a-Rest weren’t kidding when they claim that a well-cared for mattress should last years. Only in the last few months has my 18 year old Therm-a-Rest finally been retired more due to comfort issues than anything else. Over the intervening years many a company has endeavoured to replicate the success of the original Therm-a-Rest self-inflating mattress but few have garnered the same level of industry respect. Therm-a-Rest’s commitment to manufacture locally in Seattle, U.S.A. also stands it apart amongst its competitors. My first thought was the regular size ProLite Plus seemed a little on the heavy size compared with my old Therm-a-Rest, but after weighing both I was a surprised to find it actually 60 grams lighter. One reason is, apart from obviously lighter materials and better construction, the newer iteration of this self-inflating mattress incorporates a tapered design shedding the weight by almost 10 percent. Whilst not as light and compactable as the NeoAir range its also around half the price so a reasonable compromise. After unrevealing the mattress and opening the valve the mattress’s self-inflation worked well, though similar to other Therm-a-Rest’s it needs a few lungsfuls of air to achieve sufficient inflation. 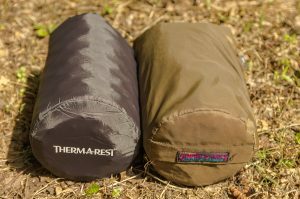 As alluded to in the introduction the biggest issue with my original Therm-a-Rest was a lack of comfort and annoyance of waking up with sore hips. High on the priority list was therefore a mattress of sufficient thickness to ensure a comfortable night’s sleep. Recently I camped on several rock ridden sites which were barely noticeably under the full thickness pad. While I have only used the mattress during this past summer it’s designed for four-season use with an R-Value of 3.8. Compared with the original and the standard ProLite mattress, the ProLite Plus delivers an additional fifty percent of insulation. Another worthy feature are the diagonal-cut foams which retain more warmth than their vertical counterparts. The soft grip nylon fabric on the underside works a treat at keeping the mattress securely in place and likewise the top polyester lining does a much better job at keeping you from sliding off at night which was an issue with my older Therm-a-Rest. One minor teething issue has been fitting the mattress into the stuff sack or even taking it out for that matter. Although the supplied sack is a nice inclusion, it has a ‘just fit’ design which while making it reasonably compact does require squeezing out every last inch of air before repacking it. I expect though, with a little practice this issue will become more manageable. Whilst by no means perfect, overall I’m very satisfied with the ProLite Plus and suspect like my original Therm-a-Rest it’s going to last the journey so to speak. If you’re after a self-inflating mattress with year round warmth and comfort or have intentions of winter camping the ProLite Plus is definitely a worthy contender. An excellent cost performance self-inflating mattress suitable for four-season use.